Donald O Castell, Inder Mainie, and Radu Tutuian. Non-acid Gastroesophageal Reflux: Documenting its Relationship to Symptoms Using Multichannel Intraluminal Impedance (MII). Trans Am Clin Climatol Assoc. 2005; 116: 321-334. Авторы: Castell D.O. / Inder Mainie / Tutuian R.
Multichannel intraluminal impedance (MII) is a new technique for evaluating esophageal function and gastroesophageal reflux. This technique depends on changes in resistance to alternating current between two metal electrodes produced by the presence of liquid or gas bolus inside the esophageal lumen. Combined multichannel intraluminal impedance and manometry (MII-EM) provides simultaneous information on intraluminal pressure changes and bolus movement whereas combined multichannel intraluminal impedance and pH (MII-pH) allows detection of gastroesophageal reflux (GER) episodes irrespective of their pH values (i.e. acid and non-acid reflux). Combined MII-pH testing presents a new paradigm for reflux testing. In MII-pH studies reflux events are no longer primarily detected by pH. Refluxate presence, distribution and clearing is primarily detected by MII and simply characterized as acid or non-acid based on pH change and as liquid, gas or mixed based on MII. MII determines refluxate clearance time while pH measures acid clearance time. MII-pH shows promise to become an important clinical tool, particularly to assess GER in the postprandial period and in patients with persistent symptoms on acid suppression therapy. Multichannel intraluminal impedance is a new technique for evaluating esophageal function and gastroesophageal reflux. Esophageal function testing is an important step in evaluating patients with possible esophageal symptoms. This is currently performed using a combination of esophageal manometry and barium or radioisotope esophagram. The current “gold standard” for gastroesophageal reflux (GER) testing is ambulatory pH-metry, a method based on detection of changes in acid content in the esophageal lumen. Even though the pathophysiologic role of acid in producing GER lesions has been well established by a number of studies in both animals and humans (1), GER-type symptoms often persist despite treatment with medications that decrease gastric acid secretion. It has been suggested that these symptoms may be due to reflux having pH ? 4.0 (i.e. non-acid reflux) (2), a type of reflux that is difficult to identify with conventional pH-metry. This review will discuss principles of impedance testing and the use of combined multichannel intraluminal impedance and pH (MII-pH) to monitor gastroesophageal reflux. The principles of this technique were first described 1990 by Silny et al. (3) and depend on changes in resistance to alternating current (i.e. impedance) between two metal electrodes (i.e. impedance measuring segment) produced by the presence of bolus inside the esophageal lumen. Electric conductivity (the opposite of resistance or impedance) is directly related to the ionic concentration of the intraluminal content. Intraluminal content with high ionic concentrations (i.e. refluxate, food) have a relative low resistance (high conductivity) compared to the esophageal lining or air. Simultaneous video-fluoroscopic and impedance measurements of esophageal function during swallowing have validated typical changes observed with bolus entry, presence and clearing in the impedance-measuring segment (Figure 1) (3,4). Fig.1. Impedance changes observed during bolus transit over a single pair of measurement rings separated by 2 cm. A rapid raise in resistance is noted when air traveling in front of the bolus head reaches the impedance measuring segment followed by a drop in impedance once higher conductive bolus material passes the measuring site. 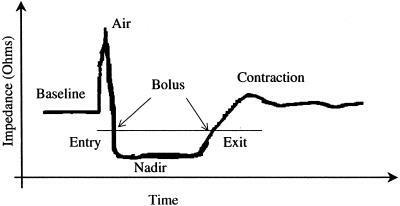 Bolus entry is considered at the 50% drop in impedance from baseline relative to nadir and bolus exit at the 50% recovery point from nadir to baseline. Lumen narrowing produced by the contraction transiently increases the impedance above baseline. In the absence of bolus, impedance is determined by the electric conductivity of the esophageal lining. Upon arrival of bolus between the electrodes impedance will often rise abruptly due to the presence of air in front of the head of the bolus. Intraluminal impedance then rapidly decreases as high ionic content of the bolus provides good electric conductivity. While the bolus is present in the impedance measuring segment intraluminal impedance remains low. 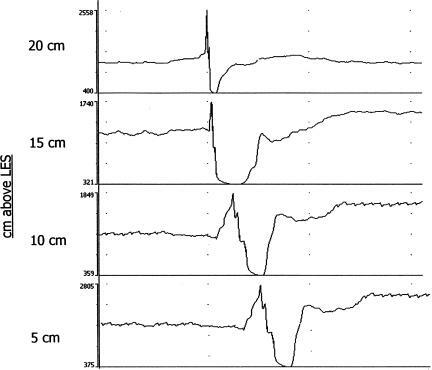 Esophageal contractions clearing the intraluminal content increase the impedance with a slight “overshoot” due to a decrease in esophageal cross-section during contraction before returning to baseline. Fig.2. Multiple impedance measuring segments within the esophagus allow determination of direction of bolus movement within the esophagus; i.e. multichannel intraluminal impedance or MII. Multiple impedance measuring segments within the esophagus allow determination of direction of bolus movement within the esophagus; i.e. multichannel intraluminal impedance or MII (Figure 2). Antegrade bolus movement (i.e. swallows) is detected by impedance changes due to bolus progressing proximal to distal (Figure 3). Retrograde bolus movement (i.e. reflux) is detected by changes in impedance progressing distal to proximal followed by proximal to distal clearance of bolus by either a primary or secondary contraction wave (Figure 4). Fig.3. Antegrade (i.e. swallows) bolus movement detected by impedance changes of bolus presence progressing proximal to distal. Fig.4. 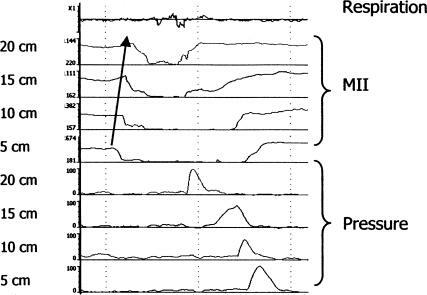 Combined MII-EM tracing in which retrograde bolus movement is detected by changes in impedance (MII) progressing distal to proximal followed by proximal to distal clearance of bolus a contraction wave. The ability of multichannel intraluminal impedance to detect intraesophageal bolus movement by changes in electric resistance as well as mounting of the impedance measuring segments on standard manometry or pH catheters allows MII to complement traditional manometry or pH testing. Combined multichannel intraluminal impedance and manometry (MII-EM) will not be discussed in this manuscript. Rather, we will review the concept of combined multichannel intraluminal impedance and pH (MII-pH) to detect GER episodes of both acid and non-acid reflux type and will discuss the evolving information on the advances in diagnosis of potential GER symptoms that this technology brings into the clinical arena. The currently accepted gold standard for the assessment of gastroesophageal reflux is distal esophageal pH recording (5), which bases detection of reflux of acidic material into the esophagus on changes in hydrogen ion concentration. Conventional pH recording has difficulties detecting non-acid reflux although some authors have proposed that reflux can be detected by pH metry even when intraesophageal pH remains above 4.0 but show a definite fall greater that one pH unit (6). Currently available techniques for the study of nonacid or alkaline reflux have several limitations: aspiration techniques (7) allow for only short analysis periods and the accuracy of enzymatic determination of the contents of the aspirates has been questioned (8), scintigraphic methods (9,10) are expensive, involve radiation exposure and are limited to short monitoring periods, ambulatory combined pH monitoring and bilirubin monitoring (Bilitec®) (11) requires the presence of bilirubin and is therefore incapable of measuring bile-free nonacid reflux which accounts for ?90% of non-acid reflux (12). Furthermore the Bilitec device requires special liquid diets during the monitoring period to avoid false positive readings (13). Multichannel intraluminal impedance used in combination with pH metry (MII-pH) has been shown to allow accurate recording of gastroesophageal reflux at all pH levels and is emerging as a useful tool to study both acid and nonacid reflux (14,15). The technique has been validated fluoroscopically and manometrically to detect bolus movement in the esophagus both in the oral and aboral direction (16), and thus enables measurement of and distinction between swallows and reflux. Because MII records retrograde flow of gastric contents into the esophagus in a pH-independent fashion, combining the technique with pH metry enables detection of nonacid as well as acid reflux. Additionally, MII-pH provides detailed characterization of the reflux episode, including determination of the composition (gas, liquid or mixed) and the height reached by the refluxate (17–19). The combined MII-pH catheter is similar to a standard 2-mm flexible pH-catheter. The “classic” 6MII-1pH assembly (Figure 5) has four impedance measuring sites (Z1–Z4) in the distal esophagus and two impedance measuring sites in the proximal esophagus (Z5–Z6). Fig.5. Schematic representation of the 2 mm diameter MII-pH catheter with impedance electrodes (4 mm in length) set in pairs at 2 cm intervals, allowing for 6 impedance measuring segments, as well as one pH electrode. 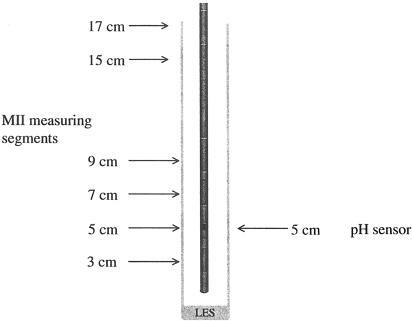 Once properly positioned, this catheter allows recording of pH at 5 cm above the LES and impedance in six measuring segments, with their centers 3, 5, 7, 9, 15 and 17 cm above the LES. The pH sensor on this assembly is at the same level as the center of the second impedance-measuring segment. The catheter is placed transnasally into the esophagus and positioned so that the pH sensor is located 5 cm above the proximal border of the lower esophageal sphincter (LES). Many studies now incorporate a second pH sensor located 15 cm more distal on the catheter to record pH in the gastric fundus. The impedance measuring segments will be located at 3 cm, 5 cm, 7 cm and 9 cm above the LES in the distal esophagus and at 15 cm and 17 cm above the LES in the proximal esophagus. Initial studies using MII-pH were done with stationary set-ups and over relatively short periods of time (2 to 3 hour recording sessions). More recently, equipment to perform ambulatory MII-pH studies over prolonged periods of time has become available (Sleuth; Sandhill Scientific Inc.; Highlands Ranch, CO). Upon completion of data acquisition tracings are edited and analyzed using a second dedicated software program (BioView Analysis, Sandhill Scientific Inc., Highlands Ranch, CO). GER composition and height. Based on different impedance patterns reflux episodes can be classified by MII as containing gas, liquid, or both. Air conducts electricity poorly and therefore has very high impedance, whereas liquid gastric contents have a low impedance. As illustrated in Figure 6, gas produces increases in intraluminal impedance and liquid gastric contents result in decreased impedance. Mixed reflux events are a combination of both liquid and gas pattern. The height or a reflux event is defined by the most proximal impedance measuring segment reached by the liquid component of the reflux episode. Gas reflux events are not assigned a height since they travel the full length of the esophagus, penetrate the UES and are eliminated. Fig.6. Impedance changes in ohms during reflux of gas, liquid, and mixed contents, obtained with a catheter incorporating six impedance measuring segments (Z1 to Z6), which are shown in the “Y” axis. Impedance values for the second measuring segment (Z2) are shown for the three reflux episodes. (a) Reflux of gas is characterized by sharp increases in impedance beginning in the most distal recording segment and rapidly progressing upwards towards the proximal esophagus. In Z2 impedance rises from a baseline of 1,360 ohms to a peak of 10,000 ohms. (b) Reflux of liquid is characterized by sequential impedance falls starting in the distal esophagus and moving upwards towards the mouth. In Z2 impedance falls from a baseline of 3,600 ohms to a trough of 260 ohms. (c) Reflux of gas mixed with liquid. In Z2 impedance rises from a baseline of 2,860 ohms to a peak of 10,000 ohms; this is followed by an impedance fall to a trough of 350 ohms. GER content: acid, minor acid, nonacid reflux and acid re-reflux. An acid MII-GER event is a MII-detected reflux event in which a drop of pH from above 4.0 to below 4.0 is noted (Figure 7a). Non-acid reflux is a MII-detected event during which the pH stays above 4.0 and does not drop more than 1 pH unit (Figure 7b). Minor acid reflux is a MII-detected reflux event during which pH stays above 4.0 but the pH drops more than 1 unit (Figure 7c). An acid re-reflux event is another type of acid reflux that occurs while intraesophageal pH is already below 4.0. It is detected by MII and the pH may or may not go further below 4.0 (Figure 7d). Fig.7. Various types of reflux events detected by MII-pH. An acid MII-GER reflux event is a MII-detected reflux event in which a drop of pH from above 4.0 to below 4.0 is noted (a). Non-acid reflux is a MII-detected reflux event during which the pH stays above 4.0 and doesn't drop more than 1 pH unit (b). Minor acid reflux is an MII-detected reflux event during which pH stays above 4.0 but the pH drops more than 1 unit (c). An acid re-reflux event is another type of acid reflux that occurs while intraesophageal pH is below 4.0 and the pH may go further below 4.0 (d). Combined MII-pH is a dual modality technique for detecting GER and it's parameters are more complex than just number of events and percent time pH <4 used by traditional pH monitoring. Besides these two pH-parameters combined MII-pH defines number of MII-GER events as the total number of MII-detected events. Refluxate presence time is defined as the total amount of liquid containing MII refluxate presence time (absolute or percent of the study period) detected by the impedance-measuring segment located at 5 cm above the LES. Refluxate clearance time is defined as the average duration of liquid containing MII-refluxate presence at 5 cm above the LES. All of the above mentioned parameters could be further separated into acid, minor acid, non-acid and re-reflux based on the pH changes recorded at the time when the reflux occurred. Based on the position of the subject at the time they occurred these parameters are further separated into upright and recumbent. Overall study interpretation is currently based on normative data proposed by Shay et al. based on the 95th percentile of these parameters in 60 normal volunteers (18) (Table 1). While normal values on PPI therapy still have to be established, at the present time the upper limit of normal on therapy of total number of reflux events can be extrapolated from the total number of MII-GER parameters off therapy since acid suppressive therapy would be expected to change only the ratio of acid vs. non-acid reflux events and not to alter the total number of events (18). a MII-GER types are based on pH probe findings. Acid MII-GER and pH-GER: pH fall above to below 4; Nonacid: MII-GER while pH ?4; Acid rereflux: MII-GER while pH <4. b % bolus exposure: duration of all MII-GER's/time monitored. c pH-only GER's: GER's detected by the pH probe, but not by MII. Skopnik et al. were the first ones to report using MII-pH to detect acid and non-acid reflux in the post-prandial period in seventeen infants with GERD. They reported detection of a large number of nonacid reflux episodes that would otherwise be undetectable by conventional pH-metry (19). Further reports in the pediatric literature have described the use of MII-pH to study the relationship between reflux, both acid and nonacid, and apnea in infants and premature babies (20,21). Several studies have examined different patterns of reflux using MII-pH in stationary conditions and over short periods of time. Sifrim et al. utilized the technique with concurrent manometry to study patterns of gas and liquid reflux during transient lower esophageal sphincter relaxations (TLESRs) in eleven normal volunteers in the postprandial period; their findings showed that in upright normal subjects, although belching can precipitate acid reflux, most acid reflux occurs as a primary event (22). In a subsequent study (19), this group of investigators evaluated the composition of postprandial refluxate in 16 patients with GERD and 15 healthy controls and found that in the postprandial period, TLESRs and reflux of gastric contents are similarly frequent in patients with GERD and controls; however, GERD patients showed more acid reflux and less nonacid reflux. They postulated that differences in the air-liquid composition of the refluxate may contribute to higher rate of acid reflux in the patient group. More recently, Shay et al. (21) employed MII-pH in combination with manometry in ten GERD patients and ten normal volunteers to evaluate the accuracy of MII in detecting individual reflux events identified by pH probe and manometry. The subjects were studied fasting in both the left and right lateral decubitus position. Overall, patients had 30-fold more reflux episodes than normal volunteers; MII detected 95% of all reflux events identified by pH metry or manometry alone and showed that liquid reflux predominates in the right recumbent posture, with gas reflux being more common in the left recumbent position. Two studies have used MII-pH to assess acid and nonacid reflux and their associated symptoms after pharmacologic manipulation. Vela et al. (18) reported on a group of subjects with frequent heartburn studied in the postprandial period. Treatment with omeprazole resulted in a significant decrease in the number of acid reflux episodes; however, nonacid reflux continued to occur and was responsible for some symptoms. Thus, acid suppression did not result in a decrease in total reflux episodes but rather in a shift from acid to nonacid reflux in the immediate postprandial period. This study also showed that taking all reflux episodes into account—both acid and nonacid reflux—results in a higher calculated symptom index. In a subsequent study of patients with heartburn, these investigators studied the effect of baclofen, a GABA B agonist, on acid and nonacid reflux and their associated symptoms (23). By inhibiting TLESRs, this medication was shown to decrease both acid and nonacid reflux as well as their associated symptoms in the postprandial period. All of the studies described above were performed in stationary set-ups and over short periods of time (3 hours or less). The findings described by these investigators await confirmation in ambulatory conditions and over prolonged periods of time. In the only published study using 24 hour ambulatory MII-pH, Sifrim et al. (22) described acid, nonacid and gas reflux in 30 patients with symptomatic GERD and erosive esophagitis and 28 healthy controls. Interestingly, they found that the total rate of reflux episodes was similar in the patients and the healthy controls. However, GERD patients had a higher proportion of acid reflux. One third of the reflux episodes were nonacid in both groups. In terms of reflux composition, mixed reflux (liquid and gas) was most frequent in both groups and GERD patients had more pure liquid reflux than the normal controls. Preliminary data from a multicenter study using ambulatory combined MII-pH involving the Medical University of South Carolina, Cleveland Clinic and Catholic University in Leuven, Belgium suggest that only 20% of patients with persistent symptoms on twice daily PPI therapy have symptoms associated with acid reflux. Combined MII-pH was able to evaluate association of persistent symptoms in the remaining 80% of patients finding that approximately half of these patients had symptoms associated with non-acid reflux while the other half of the patients had no reflux, neither acid nor non-acid, preceding their symptoms. Based on this observation we propose using the algorithm in figure 8 for a more complete diagnosis of GERD. Fig.8. 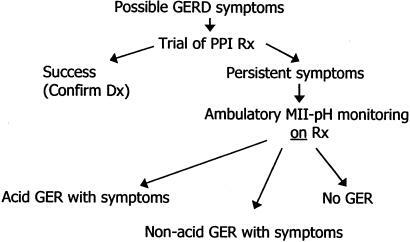 Proposed GERD diagnostic algorithm. In summary, MII-pH testing brings a shift in the GER testing paradigm. In MII-pH studies reflux events, distribution and clearing are primarily detected by MII and simply characterized as acid or non-acid based on the associated pH change and as liquid, gas or mixed based on MII. MII determines refluxate clearance time while pH measures acid clearance time. MII-pH shows promise to become an important clinical tool, particularly to assess gastroesophageal reflux in the postprandial period and in patients with persistent symptoms on therapy and with atypical symptoms. In these situations it has great potential to direct therapy into either additional pharmacologic approaches, surgery or perhaps even endoscopic modification of reflux. Blaser, New York: Don, thank you. It helps me, a non-gastroenterologist, to clarify some of the really important clinical issues. The question I want to ask you about is the relationship between clinical symptoms and pathology. I noticed that in your 5,000 PPI study, you used healing, which is a histological diagnosis because symptoms are so difficult to evaluate. So I guess my question is: Short term, what's the relationship between symptomatic improvement and pathologic change and also long term? Castell, Charleston: There is no question Marty from what you've seen from our data that it's easier to heal the mucosal lesion than it is to get rid of all of the symptoms and that many people will have continuing regurgitation despite the fact that you've taken the acid content out of their stomach or as one of my colleagues said, “anybody can overeat a PPI,” that is you can reflux a huge meal no matter what the pH. So there is a disconnect, and we've known that for a long time. And that's why the pharmaceutical companies have used healing as an end point, because it's easier to identify and it's more efficient, and the numbers are higher. They don't look too much into the symptoms, but those are the patients that come to see us. So I think that both on the short term, the eight week experiment, and the long term, there are a great number of patients out there that still have some level of residual symptoms despite PPI therapy. Giannella, Cincinnati: Don, two questions. Has this technology been applied to the study of patients with chest pain, not heartburn but chest pain? And a second question, has this technology been applied to the study of children? As you well know reflux is a significant problem in neonates. Castell: Those are important questions Ralph. Within our 125 patients to date there are a number with chest pain, and I was just looking at some of that data yesterday. About a third of the patients we see with non-cardiac chest pain are having continuing reflux precipitating their symptom, nonacid reflux. So again, I think there's going to be a role to recognize those patients using this technology. The pediatric question is really very compelling. As many of you realize in the neonatal world the question about ongoing reflux is huge. If you take infants that are being formula fed, their gastric pH is above 4 almost constantly, so it's difficult to use a pH electrode as a sensor so much so that the neonatologist will often put apple juice in the feeding, so that they have some kind of acid detector. So there are a lot of studies being done right now in the pediatric literature. In fact in our 125 patients, 30 are under the age of 16, so even though I am an adult gastroenterologist, pediatric patients are appearing for studies, and we are finding very similar results. Toskes, Gainesville: Thanks for that presentation. Once you diagnose nonacid reflux is there a therapeutic approach other than just surgery? Castell: Yes, as you might imagine we are exploring these options. The short answer to the question is that if you are having ongoing reflux despite good control of gastric acid, you need a mechanical fix, at least that's the way I look at it. So Fundoplication becomes a real consideration. However, I honestly think these patients may be the place where an endoscopic approach to reflux might really have a role and should be studied. Nobody has done that yet. We're trying to push some kind of study at MUSC, using an endoscopic approach, again mechanically to stop the reflux. When you go to medical tricks we kind of run out of things to do, you know, use a little baclofen, maybe a little bethanechd, maybe a little alginate, you are really reaching. So things that stop reflux are hard to find. Vaezi MF, Singh S, Richter JE. Role of Acid and Duodenogastric Reflux in Esophageal Mucosal Injury: A Review of Animal and Human Studies. Gastroenterology. 1995;108:1897–1907. Navaratnam RM, Winslet MC. Gastro-oesophageal reflux: the disease of the millennium. Hospital Medicine. 1998;59:646–649. Silny J. Intraluminal multiple electric impedance procedure for measurement of gastrointestinal motility. J Gastrointest Motil. 1991;3:151–162. Blom D, Mason RJ, Balaji NS, Peters J. Esophageal bolus transport identified by simultaneous multichannel intraluminal impedance and manofluoroscopy. Gastroenterology. 2001;120:P103. [Abstract]. DeVault KR, Castell DO. Updated Guidelines for the Diagnosis and Treatment of Gastroesophageal Reflux Disease. Am J Gastroenterol. 1999;94:1434–1442. Smout, AJPM. Ambulatory Monitoring of Esophageal pH and Pressure. In: Castell DO, Richter JE. , editors. The Esophagus. 3rd edition. Philadelphia: Lippincott Williams & Wilkins; 1999. pp. 119–133. Stein HJ, Feussner H, Kauer W, DeMeester T. Alkaline gastroesophageal reflux: assessment by ambulatory esophageal aspiration and pH monitoring. Am J Surg. 1994;167:163–168. Girelli CM, Cuvello P, Limido E. Duodenogastric reflux: an update. Am J Gastroenterol. 1996;91:648–653. Velasco N, Pope CE, Gannan RM. Measurement of esophageal reflux by scintigraphy. Dig Dis Sci. 1984;29:977–982. Shay SS, Egli D, Johnson LF. Simultaneous esophageal pH monitoring and scintigraphy during the postprandial period in patients with severe reflux esophagitis. Dig Dis Sci. 1991;36:558–564. Iftikhar SY, Ledingham S, Evans DF. Alkaline gastro-oesophageal reflux: dual probe pH monitoring. Gut. 1995;37:465–470. Sifrim D, Holloway RH, Silny J, Dent J. Non-acid gastroesophageal reflux. Gastroenterology. 2001;120:A436. [Abstract]. Stein HJ, Kauer WKH, Feussner H, Siewert R. Bile acids as components of the duodenogastric refluxate: detection, relationship to bilirubin, mechanism of injury, and clinical relevance. Hepato-Gastroenterology. 1999;46:66–73. Vela MF, Camacho-Lobato L, Srinivasan R, Tutuian R, Katz P, Castell D. Intraesophageal impedance and pH measurement of acid and nonacid reflux: effect of omeprazole. Gastroenterology. 2001;120:1599–1606. Sifrim D, Holloway RH, Silny J. Composition of the postprandial refluxate in patients with gastroesophageal reflux disease. Am J Gastroenterol. 2001;96:647–655. Silny J, Knigge KP, Fass J, Rao G. Verification of the intraluminal multiple electrical impedance measurement for the recording of gastrointestinal motility. J Gastrointest Mot. 1993;5:107–122. Shay S, Bomeli S, Richter J. Multichannel intraluminal impedance accurately detects fasting, recumbent reflux events and their clearing. Am J Physiol Gastrointest Liver Physiol. 2002;283:G376–G383. Shay SS, Vela MF, Tutuian R, Sifrim D, Castell D. Twenty-four hour ambulatory multichannel intraluminal impedance and pH (24 h MII-pH): A multicenter report of normal values from 45 healthy volunteers. Gastroenterology. 2002;122(Suppl 1):A577. [Abstract]. Skopnik H, Silny J, Heiber O. Gastroesophageal reflux in infants: evaluation of a new intraluminal technique. J Pediatr Gastroenterol Nutr. 1996;22:591–598. Wenzl T, Schenke S, Peschgens T. Association of apnea and nonacid gastroesophageal reflux in infants: investigations with the intraluminal impedance technique. Pediatr Pulmonol. 2001;31:144–149. Peter C, Prodowski N, Bonhorst B. Gastroesophageal reflux and apnea of prematurity: no temporal relationship. Pediatrics. 2002;109:8–11. Sifrim D, Silny J, Holloway R, Dent J. 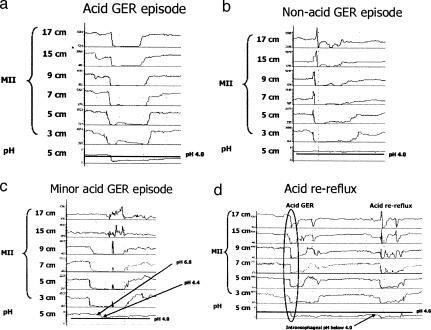 Patterns of gas and liquid reflux during transient lower oesophageal sphincter relaxation: a study using intraluminal electrical impedance. Gut. 1999;44:47–54. Vela MF, Tutuian R, Katz PO, Castell D. Baclofen reduces acid and nonacid postprandial gastroesophageal reflux measured by combined multichannel intraluminal impedance and pH. Aliment Pharmacol Ther. 2003;17:243–251. Non-acid Gastroesophageal Reflux: Documenting its Relationship to Symptoms Using Multichannel Intraluminal Impedance (MII). Donald O Castell, Inder Mainie, and Radu Tutuian. From the Division of Gastroenterology—Hepatology, Medical University of South Carolina, Charleston, SC. Corresponding author: Donald O. Castell, MD, Division of Gastroenterology/Hepatology, Medical University of South Carolina, 96 Jonathan Lucas Street, 210 CSB, Charleston, SC 29425, Phone: (843) 792-7522, Fax: (843) 792-8593, Email: Castell@musc.edu. Trans Am Clin Climatol Assoc. 2005; 116: 321–334. Copyright © 2005 The American Clinical and Climatological Association.